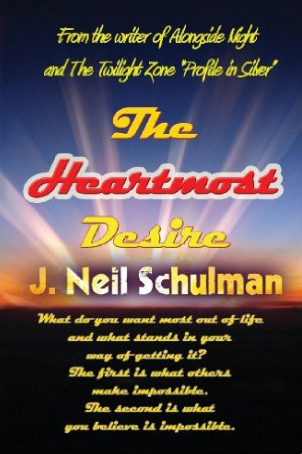 The Heartmost Desire is author/filmmaker J. Neil Schulman's most personal book, containing his manifesto for why liberty is necessary for human self-realization and happiness, and his autobiographical description of the experiences that led him from atheism to God, but still relying on reason and rejecting religion, scripture, and faith. Over the years many fans of J.Neil Schulman have said they want another book by him.Sometimes you get what you ask for ... but it's not always what you think you want. Neil Schulman is one of those writers who doesn't just write the same book over and over and over. He writes a book when he has something to say. Neil crams more into single paragraphs than other libertarians put into entire boring tomes. He can rattle off more limitations on our supposed free speech that most of us ever consider. He can recite a list of cultural taboos to frighten the staunchest social conservative. So why is he so often in hot water with other libertarians, the natural audience for this book? A libertarian defends the right to be wrong.It takes a lot of effort to initiate force or fraud.Short of that the libertarian is tolerant of actions that liberals and conservatives cannot understand. But a libertarian also has the right to judge the value of values. A libertarian can have common sense. He can weigh the good and the bad in the shadowtands where ideas have yet to be put into practice. There is one kind of libertarian who will derive no benefit from the words that follow. That is someone who has no heart. "The Lord ain't my shepherd / Cause I ain't no sheep. / I'm a god in a body / Not Little Bo Peep." Cause I ain't no sheep. What is the essence of the individual human identity? We might call it the personality or the ego, that which makes me, me. Is it any less real to call it the soul, the spirit or the divine spark? I do not see why it should be, if we are talking about the same thing. Thus, the above poem could be misleading to anyone who decides not to read further. Schulman is a philosopher, not a theologian. He writes about his own personal experience and his interpretation of that experience, and never demands that we accept his view on faith. He is not trying to create a cult following. He is attempting to open a reasoned discussion. Basically, his is telling us a story, a story about what happened to him, and what he thinks it means. We are free to take it or leave it, to accept the possibility that he believes what he is saying and not trying to fool us, or to refuse to understand and misrepresent his intention, as, unfortunately, many have done. In the end, it does not really matter if Neil's personal understanding of his experience is true or false. It is his experience, not ours. What matters is how we chose to understand what he is telling us. No understanding will be gained by a swift and superficial reading of his thoughts. It is crystal clear to anyone who has written poetry, to anyone how has written fiction, or told a story, that there are other forms of communication besides solid logic and hard reason. J. Neil Schulman is an award-winning writer and filmmaker, whom the Wall Street Journal called a pioneer of electronic publishing His 1979 Prometheus-Hall-of-Fame novel Alongside Night -- endorsed by Milton Friedman, Anthony Burgess, and Ron Paul -- projected the economic meltdown and was Freedom Book of the Month for May, 2009. It's now his second feature film, starring Kevin Sorbo, Jake Busey, Said Faraj, Tim Russ, Garrett Wang, and Gary Graham, following his award-winning comic thriller, Lady Magdalene's, starring Nichelle Nichols; Schulman wrote, produced, directed, and acted in both films. His 1983 novel, The Rainbow Cadenza, won the Prometheus Award, was adapted into a Laserium show; and Robert A. Heinlein told the 1983 L-5 Society, "Every libertarian should read it!" Schulman scripted the CBS revived Twilight Zone episode, "Profile in Silver." He taught a graduate course on electronic publishing for The New School, has written for popular magazines and newspapers including National Review, Reason, the Los Angeles Times, and Reader's Digest, and monographs ranging from animal rights, informational property rights, and medicalization of criminology have been widely anthologized by academic presses. His 12 books include Stopping Power: Why 70 Million Americans Own Guns, endorsed by Charlton Heston and Dennis Prager, Self Control Not Gun Control endorsed by Walter Williams, and The Robert Heinlein Interview and Other Heinleiniana, which Virginia Heinlein said "should be on the shelves of everyone interested in science fiction." Learn more about J. Neil Schulman on his website, The World According to J. Neil Schulman. Read J. Neil Schulman Biographical Info. Read Interviews with J. Neil Schulman. Return to the Pulpless.Com Home.